"Finding Meaning" explores the ideas of our existence and the meaning of it all. The world has always searched for meaning, for reason, for causality. The human mind's endless quests have accelerated evolution beyond its natural or earlier subtle pace. Societies, groups, communities.. We have developed for ourselves comforts and luxuries and longevity and health care. Is survival the only concern, self preservation. Alongside curiosity and search for knowledge is greed. A greed that has brought us to this anthropocene that threatens the existence of life as we know it. We search for meanings but is there any? Are we here for a purpose or do we exist accidentally? What is conscience how does it relate to the world around us? The beauty of it all is stupendous. We try to find meaning of life and deconstruct our emotions. An exploration through art. In the pleasing to some, painful to some; and befuddling to all world of colours, shapes, sounds, smells, sensations and feelings, ambiguity and perception become the bane and the saving. And at the center of our universe we stand like dots, whether we like it or not; but so are we our own center and the universe revolves around us, whether one likes it or not, hence the ultimate triumph of mind over matter. We create our own world, with all its allure and all its unsightliness. With this show we explore the inscrutable and the fathomless, a range of popssibilities between the real and the represented. In a confabulation of our reality and the reality of the artist and the real somewhere in between, we step into the penumbral world of our limited senses, challenging everything we have known, from the palpable to the intangible, leaping into the terrifying infinity of the multitudinous universes that lie between the real and what we see. Artist Ashok Gulati, The universe has always been a source of wonder to him and through his masterful strokes of colour, he explores the enigmatic and transcendent nature of the universe. His compositions are characterized by three main elements which breathe life into every piece of this series. First is the daring use of water based colours which is the perfect setting for the second element, which is the vertical line running from the top to bottom representing the cosmic. Last but not the least, is the clever use of perforation and puncturing of the paper within the composition giving his pieces an interesting dimension which resonates with the mysticism. The combination of these three elements adds to the celestial aura of every piece breathing life into each of the compositions. Ashok Gulati’s work reflects his maturity in the expressing the structured through the abstract. Artist Devidas Agase, Puppet like figures dance, despair and defy as avatars of the artist’s voice as he explores individuality, society, politics and war. His mascot shapeshifts from anatomical to insectlike to divine parodying the myriad influences that ceaselessly transform the body and mind. Devidas Agase uses installation, paper, jute and a limited palette to give his creativity form, and tell the story of the dissipated, overwrought and teetering individual in an increasingly complex and exacting world. Artist Bhuwal Prasad, Forever intrigued by tribal cultures and rituals, he incorporates these into his art, sometimes eliciting a cacophony of colors while sometimes finding that baser expression in black and white. With a method to the madness, he begins with a design and theme and lets it evolve and take on its own form. Artist Navakash, fuses abstract forms together with near transcendental cohesion, choosing angular to circular of kaleidoscopic intensity; as the dizzying forms suggest themselves to our senses capturing us unawares, equally provocative are his colours which burst and contrast and unswervingly lift Navakash’s stories to us till we the visual reverberates with our own exposed unconscious. 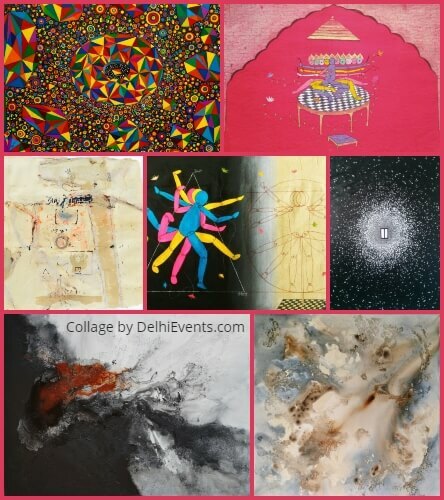 Other Participating Artists at the event are Kavita Jaiswal, Paveen Kedar, Pratul Dash, Ravi Morya, Sandra Hansen, Shahenshah Mittal, Shobha Broota, Surajit Biswas, V.B. Harilalkrishnan, Pradeep Ahiwar and Yashwant Singh.